Please e-mail me to order PDFs and arrange for a PayPal invoice. Por favor envíeme un email para solicitar los archivos pdf y organizar una factura PayPal. A note for teachers: If you would like to use any of these PDFs in your classes, please e-mail me for details. 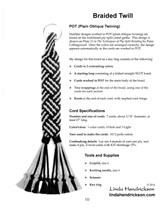 This page includes PDFs of all 28 projects in my book How to Make Ply-Split Braids & Bands. Las instrucciones para este proyecto están también disponibles en español. 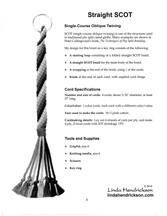 This braid is from my book How to Make Ply-Split Braids & Bands. 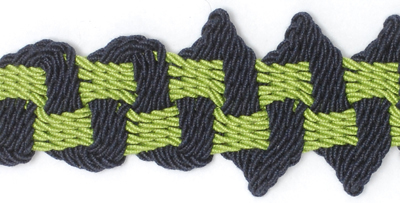 Straight SCOT (single-course oblique twining)is the easiest and most straightforward ply-split braid for beginners. A colorful braid makes it easier to find your keys! I also attach ply-split braids to my luggage. The step-by-step instructions include 4 pages of text and 8 black-and-white photos. You can see how Straight SCOT is worked by watching the beginning of my video "Ply-Split Waves Braid". A short length of Straight SCOT is made and then folded to make the starting loop. The Waves braid is the first braid I teach in my beginning ply-splitting workshops. The structure of this braid is SCOT -- single-course oblique twining. Watch my video "Make the Ply-Split Waves Braid". 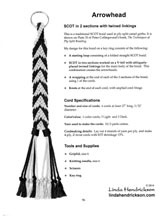 I designed this shaped SCOT braid in 2000 for my booklet Great SCOT! A Beginner's Guide to Ply-Split Braids in Single-Course Oblique Twining. 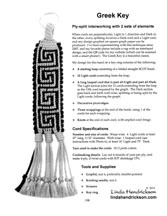 These more detailed instructions are from my book How to Make Ply-Split Braids & Bands. The method involves just two steps: working all of the cords for a few rows, and then setting two cords aside and working the remaining cords for a few rows. The number of rows worked during the second step determines the size of the loops. The step-by-step instructions include 6 pages of text and 13 black-and-white photos. 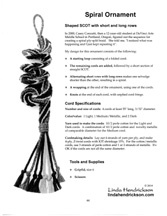 This is a shaped SCOT braid designed by Peter Collingwood, which appeared in my booklet Great SCOT! A Beginner's Guide to Ply-Split Braids in Single-Course Oblique Twining. 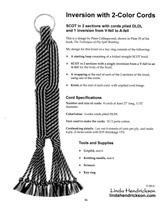 These more detailed instructions are from my book How to Make Ply-Split Braids & Bands. The sample includes two variations of SCOT in two sections with extra-twist between some splittings. In the second variation, the cords in one section always function as splitters. Since these elements are never split, they don't have to be plied cords. 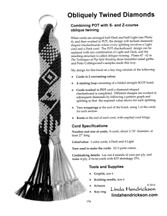 You could use round kumihimo braids, beaded wire, tubular tablet weaving, etc. The step-by-step instructions include 8 pages of text and 17 black-and-white photos. 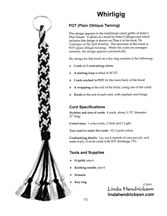 These instructions are from my book How to Make Ply-Split Braids & Bands. 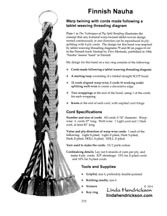 I designed this braid in 2008, based on traditional 3-strand braids. In this ply-split version 4 cords make up each strand of the braid. The structure is SCOT (Single Course Oblique Twining) with extra twist between the splittings at the edges. Very simple to do, and imagine the possibilities! For example, each strand could be a different color, and you could expand the idea to more strands. The step-by-step instructions include 6 pages of text and 15 black-and-white photos. The structure is SCOT (Single Course Oblique Twining) with extra twist between the splittings at the edges. The step-by-step instructions include 6 pages of text and 15 black-and-white photos. 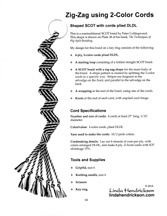 These instructions are from my book How to Make Ply-Split Braids & Bands. 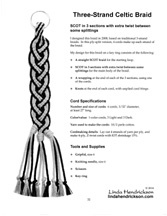 This is an easy project which involves repeating just two rows of SCOT -- a long row, and a short row (where the penultimate cord is pulled through). This causes one selvedge of the braid to be shorter than the other, and the result is a spiral. The step-by-step instructions include 4 pages of text and 11 black-and-white photos. The design is based on a sample that I made in my first ply-splitting workshop with Peter Collingwood in 1993. 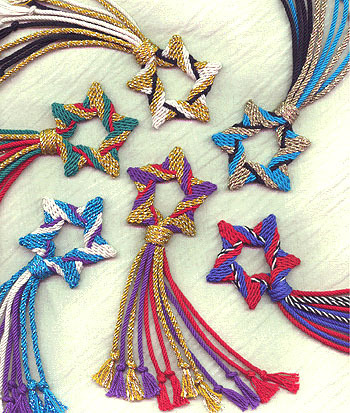 Five points are worked in SCOT (single-course oblique twining), and a wrapping joins the two ends of the braid into a star. The step-by-step instructions include 8 pages of text and 20 black-and-white photos. 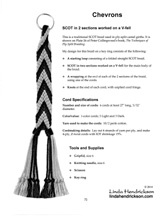 The zig-zag is a nontraditional ply-split braid shape by Peter Collingwood. The shape is shown on Plate 38 of his book The Techniques of Ply-Split Braiding. The structure is SCOT (single-course oblique twining). 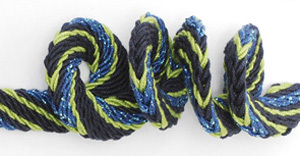 The zig-zag is a nontraditional ply-split braid shape by Peter Collingwood. The shape is shown on Plate 38 of his book The Techniques of Ply-Split Braiding. The structure is SCOT (single-course oblique twining). The cords for this braid have 2 colors, plied Dark/Light/Dark/Light. The stripe pattern is created by splitting the 2-color cords in a specific way. The step-by-step instructions include 8 pages of text and 15 black-and-white photos. There are several photos of this traditional design in The Techniques of Ply-Split Braiding by Peter Collingwood. 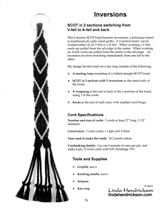 The structure is SCOT (single-course oblique twining), worked on a V-fell for the body of the braid. The step-by-step instructions include 6 pages of text and 14 black-and-white photos. This 2-section SCOT braid features inversions, a technique found in traditional ply-split camel girths. A 2-section braid can be worked either on a V-fell or an A-fell. When working a V-fell, cords are pulled from the selvedge to the center. When working an A-fell, cords are pulled from the center to the selvedge. An inversion involves switching immediately from one fell to the other. The step-by-step instructions include 8 pages of text and 22 black-and-white photos. This is a nontraditional design by Peter Collingwood, shown on Plate 35 of his book The Techniques of Ply-Split Braiding. The structure is SCOT (single-course oblique twining) in 2 sections with a single inversion from a V-fell to an A-fell. 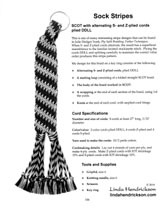 The step-by-step instructions include 10 pages of text and 20 black-and-white photos. This is a traditional design used in ply-split camel girths of India's Thar desert. It is shown on shown on Plate 33 of The Techniques of Ply-Split Braiding by Peter Collingwood. The structure is SCOT (single-course oblique twining) in 2 sections with twined linkings. The step-by-step instructions include 10 pages of text and 27 black-and-white photos. 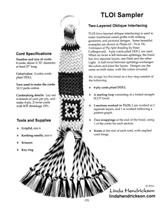 This is one of the many interesting stripe designs that can be found in Julie Hedges' book Ply-Split Braiding: Further Techniques. When S- and Z-plied cords alternate, the result has a superficial resemblence to the familiar knitted stockinette stitch. Plying the cords DDLL and splitting carefully to maintain the correct value order produces this stripe pattern. This design appears in the traditional camel girths of India's Thar Desert. A photo of a braid by Peter Collingwood which includes this design is shown on Plate 6 in his book The Techniques of Ply-Split Braiding. The structure of this braid is POT (plain oblique twining). The step-by-step instructions include 4 pages of text and 9 black-and-white photos. This contemporary design is made with 2-ply, 2-color cords, worked in POT (plain oblique twining) with a full twist between the splittings. The result is a braid in which Light is dominant on one side, and Dark on the other. The surface texture looks like a waffle. A camel girth from India with this traditional design is shown on Plate 11 in The Techniques of Ply-Split Braiding by Peter Collingwood. The structure of this braid is POT (plain oblique twining). This ply-split meshwork is found in the traditional anti-fly fringes called mukhiarna, worn by horses in India. Examples are shown in Plates 118 and 119 in Peter Collingwood's book The Techniques of Ply-Split Braiding. Julie Hedges calls this technique POTholes in her book Ply-Split Braiding: Further Techniques. The step-by-step instructions include 8 pages of text and 24 black-and-white photos. This idea comes from the Swiss braiding expert Noemi Speiser. The working method, alternating a row of SCOT with a row of POT, makes half of the cords move parallel to the selvedge and the other half move diagonally with a nice surface texture. An extra row of SCOT halfway through the braid reverses the values. 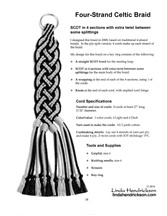 One way to expand the possibilities for hairline designs in POT is to add a technique called twice-split cords. 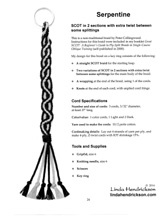 This is a braid that I designed in 2006 based on text and diagrams starting on page 56 of Peter Collingwood's book The Techniques of Ply-Split Braiding. The step-by-step instructions include 10 pages of text and 22 black-and-white photos. This braid introduces the concept of combining POT (plain oblique twining) with S- and Z-course oblique twining. The cords are arranged so that every splitting in the center diamonds always involves a Light cord and a Dark cord. Many designs are possible in these areas. The first diamond, the checkerboard, is worked in POT, and the remaining diamonds show three designs worked in oblique twining. Plates 47 - 62 in The Techniques of Ply-Split Braiding show beautiful camel girths and Peter Collingwood's samples made this way. 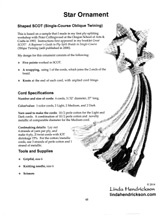 The step-by-step instructions include 10 pages of text and 26 black-and-white photos. TLOI (two-layered oblique interlacing) is used to make traditional camel girths with striking geometric and pictorial designs. Some beautiful examples are shown in Plates 63-74 in The Techniques of Ply-Split Braiding by Peter Collingwood. 4-ply cords plied DDLL are used. When no twist is left between splittings, the braid has two separate layers, one Dark and the other Light. A half-twist between splittings exchanges the colors and joins the layers. Designs are the same on both sides with the colors reversed. 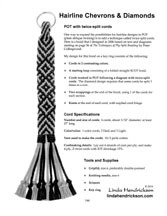 TLOI (two-layered oblique interlacing) is a traditional ply-split braiding technique used in India for creating camel girths with striking geometric and pictorial designs. 4-ply cords plied DDLL are used, and the splittings involve either no twist to keep the value the same, or a half-twist to change the value. Designs are the same on both sides with the colors reversed. In this braid, the designs are letter shapes. The step-by-step instructions include 10 pages of text and 28 black-and-white photos. Maggie Machado designed this ply-split band with rounded edges. I added the option for pointed edges. Dark and Light cords are perpendicular to each other in the body of the band. 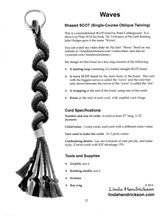 The four Dark cords move together, alternating function (splitting and being split) with the eight Light cords. When cords are perpendicular, with Light in one direction and Dark in the other, every splitting involves a Light and a Dark cord, and any design graphed on square graph paper can be produced. The Greek Key is a beautiful classic design. This ply-split version uses 13 Light cords in the lengthwise direction and one very long Dark cord which goes back and forth, splitting or being split, according to the pattern graph. The step-by-step instructions include 12 pages of text and 31 black-and-white photos. Any 4-strand warp-twined tablet-woven design turned continuously in one direction can be reproduced in ply-splitting with 4-ply cords. This concept is illustrated in Plate 1 in The Techniques of Ply-Split Braiding by Peter Collingwood. The design for this band was inspired by tablet weaving threading diagrams 79 and 80 on pages 61-62 of the Finnish book Nauhoja by Viivi Merisalo, published in 1966. "Nauha" means "band" in Finnish. The step-by-step instructions include 10 pages of text and 23 black-and-white photos. This page created on August 7, 2015 and updated on April 11, 2017.